It was a pretty good month for empties however they were mostly household items. I backed off a lot of makeup wearing this month since I'm desperately trying to get my skin under control. My skin has been super dry and red and I really don't want to anger it anymore then I already have. 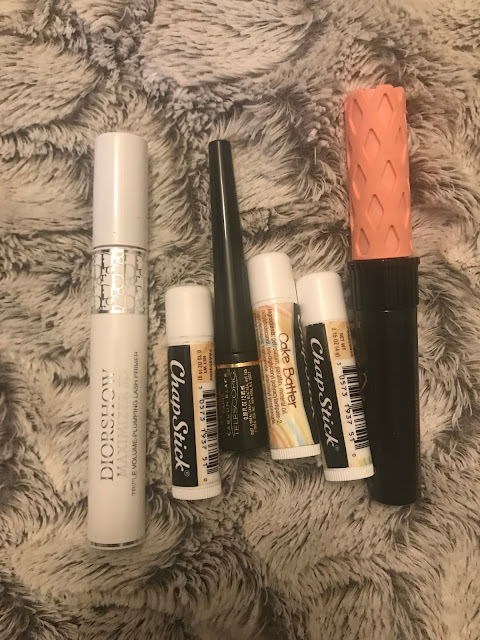 Only three chapsticks were finished up this month! That might be a new record low for me because I absolutely love this Cake Batter flavor. I felt it was time to end my use three of my eye products since I know the three months recommended for use has definitely gone by. Benefit Rollerlash Mascara is amazing! I will definitely continue to purchase this even though it's more expensive then drugstore mascara. I really liked the L'Oreal Telescopic Liquid Eyeliner but I will be trying some other liquid liners. Lastly in this category I haven of my favorite products of all time: Diorshow Maximizer Mascara Primer! This product makes my lashes SO long and SO full it's amazing! I can use it under any mascara and it's incredible. I hate when I don't have it! I finished up a body spray from Bath and Body Works in Oahu Coconut Sunset which I thought was nice. I definitely wouldn't repurchase it in the future just because I have many other scents I do prefer over this one. I decided to toss these Pacifica Deodorant Wipes since I've had them forever and never use them. I originally bought them for Disney World but only used one or two. They work okay but not for a long period of time- so don't expect to use them in place of deodorant! Next up is Bath and Body Works Tiki Mango Mai Tai shower gel which even Tim was using because it smelled so amazing! I will definitely repurchase this in the future! We finished two hand soaps this month. 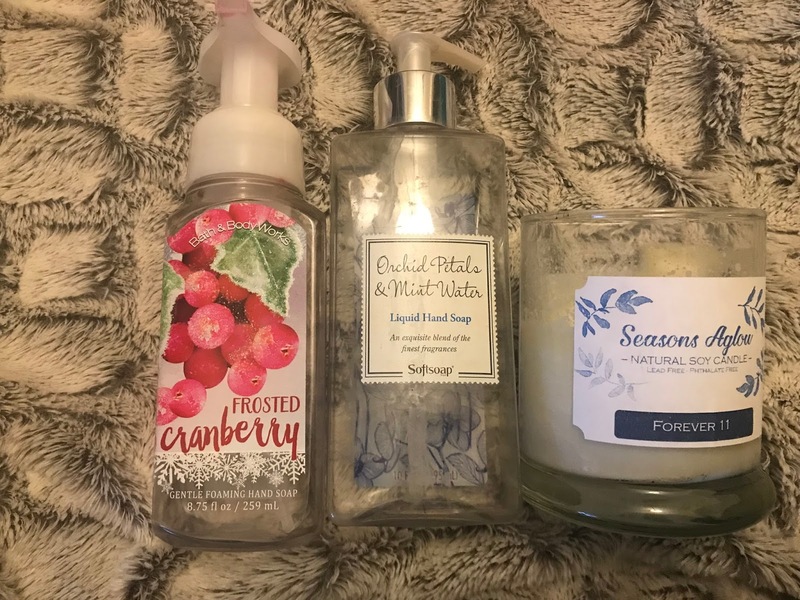 The first is from Bath and Body Works in Frosted Cranberry. This was a good scent but not one I feel the need to repurchase in the future. The second is Softsoap Orchid Petals and Mint Water. I didn't love this scent either and wouldn't repurchase it. The one candle I finished up was from a Fundraiser for a girl who passed away suddenly in my community. Not a candle to repurchase regularly but I'm glad that I purchased it to help fund scholarships in her memory. I have been LOVING Mrs. Meyers for my household products lately. I order all of mine through Grove Collaborative and their service is superb. Getting my shipment once a month means I don't have to run out and pick up any cleaning products at the store because I'm running low- I'm always stocked up! Use this link and get $10 off your first order!! My favorite scent that I've tried so far has got to be Basil! I thought it was a weird scent based on the name but the smell is incredible- I highly recommend it and will definitely purchase this multi surface spray again in the future. I also finished two dish soaps from Mrs. Meyers- one in the limited edition Mint scent and one in Honeysuckle. I would repurchase both in the future but I didn't love either of them as much as I love the basil! My last category for this month is laundry products. The laundry around here is never-ending! There are only two of us but some weeks I am in shock that we've gone through as many clothes as we have. I finished the last of my Purex Crystals. I love this product and I always think that my laundry smells SO MUCH BETTER when I use it! I haven't repurchased this yet just because I like to wait for a good deal/coupon but will definitely buy it again in the future! I finished two Tide laundry soaps which I love. Tide is one of my favorite laundry products and it works great on getting out stains. The last laundry product is Xtra which was a coupon purchase from CVS. This laundry soap works just fine but I definitely wouldn't pay for it! Those are all my empties for the month of March, what did you finish up this past month? What products are you loving/hating right now? Share in the comments!